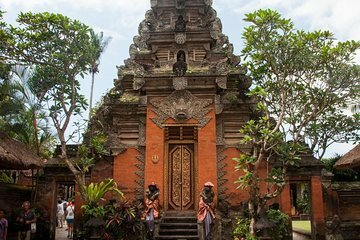 Bali's temple-rich artist city of Ubud is one of the prettiest and most interesting spots on the island, and on this full-day private tour, you'll have the chance to visit some of its most important sites. You'll visit the Goa Gajaj (Elephant Cave Temple), the Kintanmi Volcano, and the Tegalalang Rice Terrace. You'll also visit a coffee plantation and spend time in the monkey forest, home to hundreds of little primates, before concluding at the Ubud Palace. Me and my wife had a really nice time during the trip, because the guide was speaking english really well and was really informative. The tour took for 8 hours and during this time we saw all the places that were marked in the description. Overall, I would highly recommend this trip to anyone. We really enjoyed our tour. Our tour guide Puto, spoke very good english, and was able to give a detailed rundown of the cultural background to the area. He was very accomadating to our needs, if we wanted to spend extra time on some things. He was also able to take us to not so commercialised dinning experierce. All in all we really enjoyed the day. All the spots we went to were really worthwhile and enjoyable. Downside was that the tour guide spoke hardly any English, he was just a driver and didn't tell us anything about the sites we visited.